There is speculation around Apple’s upcoming tablet PC and attention has been very much focused on that but if you are not aware, Freescale has unveiled a new smartbook tablet PC reference design recently targeted for netbook market. 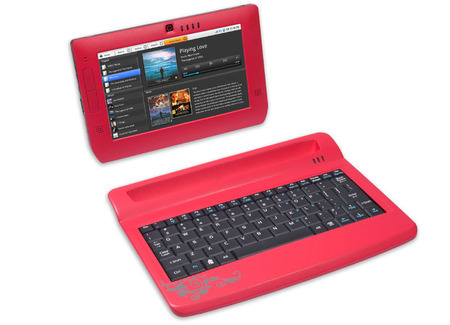 Powered by its own i.MX515 processor, the new design is featured with a 7-inch 1024 x 600 resolutions touch screen LCD that allows even much greater mobile computing experience as compared to smartphone devices. On the other hand, the machine is more compact as compared to typical netbook machine while still having similar full features to serve as a great mobile companion for those frequent travelers. Since it is based on ARM Cortex A8 technology, users can expect a thermally efficient advantage over X86 based reference platform suitable for usage model that needs longer battery life for true portability. Besides, the ARM Cortex-A8 core is believed to be able to deliver up to 2100 Dhrystone MIPS with maximum core frequency clocking up to 1GHz. Other hardware specifications include a 512MB memory RAM, up to 64GB internal storage, an expandable micro SD slot, 3-axis accelerometer, optional hard keyboard, 3G, 802.11b/g/n, Bluetooth, USB 2.0 port, 3MP camera and many more. Measured around 200 x 128 x 14.9mm and weighted merely 376 grams, the tiny machine is expected to be retailed at sub $200 which is quite affordable for average users. Tentatively planned to be released in February time frame, the machine will either be preloaded with Linux or Android but not Windows Operating Systems due to limitation on ARM architecture.